ST. LOUIS (AP) Miles Mikolas joked that he might need to show only his left side during postgame interviews, all because he thought he found a gray hair on the right side of his beard. Whatever the cause of the stray gray for the 29-year-old St. Louis Cardinals starter, stress likely isn’t a possible culprit this these days. Mikolas continued his early season dominance of the National League Central on Friday night, throwing seven shutout innings in the Cardinals’ 3-2 win over the Chicago Cubs. After three seasons in Japan, Mikolas (4-0) has looked little like the former Texas Rangers starter who struggled with a 6.44 ERA in his last big-league go-around in 2014. The right-hander didn’t walk a batter for a third straight game on Friday, and he’s now allowed only two walks in 40 innings this season. Mikolas’ ERA fell to 2.70 as he allowed seven hits in his sixth start after signing a two-year, $15.5-million contract with the Cardinals during the offseason. Each of his starts has come against Central teams, and he’s allowed two or fewer runs in four straight games – throwing seven innings in each. The win was the third straight for the Cardinals, their second in three games this season against a Chicago team they lost 14 of 19 games against a year ago. The Cubs, meanwhile, have now lost three games in a row for the first time this season. 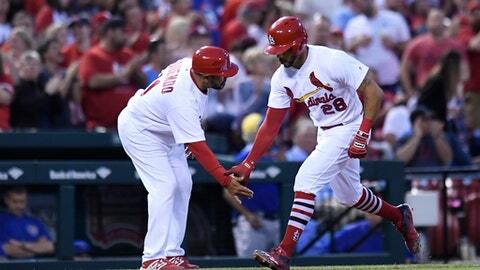 Tommy Pham provided the scoring for St. Louis with a three-run home run off Chicago starter Jose Quintana (3-2) in the second inning. All three of the runs were unearned after an error by Cubs shortstop Javier Baez, his eighth error of the season and third in his last five games. Bud Norris earned his seventh save in seven chances for the Cardinals, doing so despite allowing three hits and two runs in the ninth inning. Prior to scoring its late runs, Chicago’s best chance came in the fifth inning when pinch-hitter Ian Happ doubled to give the Cubs runners at second and third with one out. Mikolas, however, followed by striking out Ben Zobirst and forcing Kris Bryant to ground out to end the inning – leading to a first pump and yell from the right-hander as he walked off the mound. St. Louis starter Adam Wainwright threw a bullpen session on Friday, and Cardinals General Manager Michael Girsch said he would meet with the right-hander on Saturday to decide his next step in returning from elbow inflammation. Wainwright has been on the disabled list since April 20th, and Girsch said it’s possible the 36-year-old will need a rehab start before returning to the Cardinals’ rotation. Wainwright is 1-2 with a 3.45 ERA in three starts this season. Cubs: Addison Russell sat out for the second time in six games for Chicago, with Baez starting at shortstop instead. Maddon said the day off for Russell wasn’t injury related. Cardinals: Girsch said reliever Brett Cecil is expected to have one more outing in extended spring training and could possibly start a rehab assignment next week. Cecil has been out since injuring his left shoulder on opening day. Cubs: After his best performance with Chicago, RHP Tyler Chatwood starts for the Cubs in the second game of the weekend series on Saturday. Chatwood threw seven scoreless innings in a win over Milwaukee last weekend, and he’s 2-3 with a 2.83 ERA in his first season after leaving Colorado to sign with Chicago. Cardinals: RHP Luke Weaver has allowed four of more runs in each of his last three starts. He will try to improve on his 2-2 record and 5.17 ERA.